Welcome to the Igneus Hydrant Flow Test - a free flow test reporting program for your personal computer. Igneus Hydrant Flow Test is a simple hydrant flow test report program capable of printing and saving professional level reports you can be proud of. Igneus Hydrant Flow Test calculates flow and pitot pressure in accordance with NFPA 291 "Recommended Practice for Fire Flow Testing and Marking of Hydrants", 2007 edition. Igneus Hydrant Flow Test can even handle multiple flowing outlets. 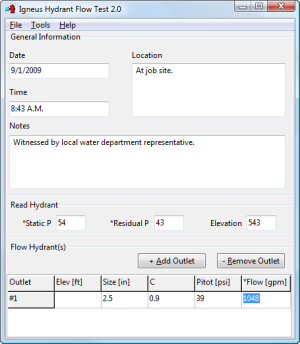 Once the flow test information is entered, a professional one page report can be previewed, printed, or saved as an industry standard pdf file. Plus, Igneus Hydrant Flow Test saves flow information in a plain text file. What does this really mean? NO VENDOR LOCKIN - your information is yours! Oh yeah, Igneus Hydrant Flow Test is also FREE. Be sure to visit our Files page to download your free copy today! And don't forget to check out the Simple Hydraulic Calculator while you're here.